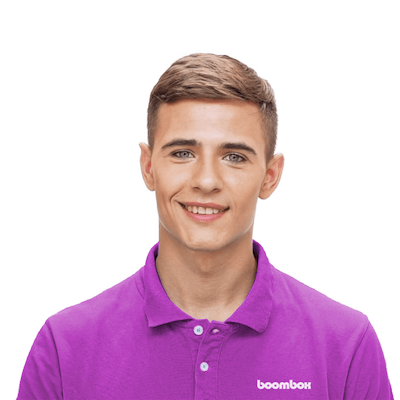 Boombox is a full-service storage company that manages the pick up, storage, and retrieval of your extra things. Boombox comes to you so that you never have to deal with the frustration and inconvenience of using a self-storage facility again. No more dusty storage units, no more digging through boxes or losing track of your things. Boombox makes storage simple. Boombox arrives at your location with a vehicle and a team of movers. We apply unique codes to each item, photograph every item being stored, and transport your items to our secure storage facility. Whenever you want one or more of your items, simply log in to your Boombox account, select what you need delivered, and schedule a return delivery. We’ll bring your items back to your door. Boxes, furniture, bicycles, golf bags, holiday decor, baby clothes, books, appliances, pretty much anything except the following: liquids, illegal substances, perishables, hazardous materials, firearms, vehicles, For a complete list of prohibited items please see our Terms Of Service. Boombox does all the work for you so you never have to visit a storage unit again. For security purposes, our storage facilities are closed to the public. With Boombox you can always view your stored items online by logging in to your Boombox account. Whenever you need an item returned, just go online and schedule a drop-off. Or, if you need to add more stuff to your storage plan, you can book another pick-up online as well. Boombox proudly serves the San Francisco Bay area. For a complete map of our service areas, visit our Locations Page. How much does it cost to get my stuff out of storage? We make your stuff as accessible as possible. All deliveries are a flat rate of $20 per van load. That's cheap! Is there a minimum payment term? Yes the minimum payment term is 3 months. You can receive your items back before the three month period has ended but you'll still be charged for the minimum term of three months. Your first bill for storage is charged on the day of your first pick-up. Your storage subscription officially begins on the day of your initial pick-up. How does Boombox handle billing? Billing is automatic so you don’t have to worry about it. Your first payment is due on the day of your initial pick-up. Your second payment will be due 30 days after your first pick-up date. To update your billing information please text our customer service line and we will take care of it for you! How do I cancel my storage plan? It's no problem. Just text us and we will set up a time to deliver your stuff back to you. How does the storage pick-up work? We meet you at your location with a team and a van. Our team will add unique codes and photograph each item that will be stored, and make sure each item is securely packed before loading in our truck. Within 48 hours, you’ll be able to log into your account and see your complete storage inventory! How much is it to pickup previously delivered items? Pickups of previously delivered items are a flat rate of $25. Can you pick up my stuff today? Tomorrow? If you need a pick-up urgently text us: (415) 322-3135. Keep in mind that we schedule storage pick-ups on a first-come, first-served basis. We typically ask that you give us a two day heads up before scheduling a pickup, however, if we have an open slot we will do our best to fit you in. Not a problem! Simply log in to your account and select all of your items and specify a return date for your final drop-off. If you schedule a final drop-off before the minimum storage term is up, your account will be charged for the months remaining on the minimum term. During your initial pickup we apply barcodes to each item, and photograph everything so there is a record of what’s in storage and what condition it was received in. We make sure to complete the photographing during the pick-up so if the worst should happen, we can expedite the claims process. Note: We cannot guarantee the contents of the box if we are not able to see what’s in it. We will still be responsible for returning the box, but the contents cannot be insured if we cannot verify that they are packed properly to prevent damage. Please review our Limited Security Warranty Policy for complete details. Do I need to have my items packed before Boombox arrives? Yes! This makes sure everything runs smoothly. Everything that can fit in a box must be in a box upon arrival. We are there to help you move your items but packing should be done ahead of time. Can I pack my items in garbage bags, duffel bags or shopping bags? We prefer boxes or plastic bins, but we do make exceptions. Remember you are responsible for securely packing your items. Disassemble furniture. Best to get this done before your pick-up. Seal boxes and add description. Boombox will photograph each box and add the description to your online storage account. Since we cannot see the contents of your box you are responsible for storing your items safely. Pack related items together. For example, pack your ski boots and winter clothes in the same box so that when ski season rolls around you can easily select the boxes you want returned to you. Label your boxes clearly. Make sure your notes and labels on the outside of the box make sense to you. This is especially important if you are storing a lot of boxes that look similar. Pack boxes tightly. Surround your items with crumpled newspaper, packing peanuts, or bubble wrap to make sure your items do not shift within the box. Absolutely! All we ask it that you protect the furniture appropriately and that you request a Two Person Moving team if any of your items are over 50 lbs. The moving crew will wrap your furniture pieces in moving blankets upon request. Will Boombox wait while I pack my boxes? No. All packing must be done ahead of time. If you are still packing we will reschedule your appointment and charge a cancellation fee of $55. Yes. To keep our service running smoothly we ask that you give us 1 days notice before canceling any pickup or delivery. Pickup cancellations are $35. Delivery cancelation fees are $35. You are responsible for making sure all items are safely and securely packed. We can not insure items that have not been packed properly. What is the weight limit on each box? For a One Person Moving team, each item should not exceed the maximum weight of 50 lbs. For a Two Person Moving team, each item should not exceed the maximum weight of 100 lbs. How do I schedule a storage pickup? Just click the "Book Now" button at the top of the page and you'll be on your way! When can Boombox pick up my stuff? That depends on how much stuff you need to store, and what our calendar looks like. We might be able to fit you in tomorrow, or it might be three days from now. Weekends and the end-of-the-month are always busy, so it’s best to reserve your preferred pick-up time as soon as possible, even if you plan to keep shopping around. There’s no fee to cancel or reschedule your appointment, if you call us 48 hours before your pick-up time. It’s easy! You can schedule a return delivery by logging into your Boombox account, and clicking the "Book Delivery" button then select the items you would like returned, and specify a return delivery date. We ask that you give us 2 days notice before scheduling a delivery. Please text us at (415) 322 3135 and we’ll help you reschedule your appointment. As long as you call to cancel or reschedule at least 48 hours before your scheduled appointment, there is no cancellation fee. Cancellations or rescheduled appointments with less than 48 hour notice incur a $35 cancellation fee. When can I schedule a delivery? At least 48 hours are required to schedule a return delivery. That gives us enough time to plan our route, unpack and repack just what you asked for, and make sure it is safely loaded in the delivery vehicle. However, all scheduling is subject to availability so it is best to book in advance to get the delivery time you want. How long does it take for Boombox to arrive? Will Boombox wait for me if I am running late? If something comes up and you know you’re going to be late to your appointment, text us a at: (415) 322-3135. We want to help you, but if waiting for you means being late to our next customer, we will have to reschedule your appointment. A One Man Moving Team is FREE! What if I need to store something really big, or really heavy? We prefer that you tell us about all your marble coffee tables and duffel bags full of cement blocks before we arrive. To ensure safe working conditions, Boombox may need to send additional movers to your appointment. If that is the case, you will be notified ahead of time and the cost of the extra mover will be added to the labor costs for the appointment. How will the movers help me with storage? Our teams are obsessed with making sure your items are inventoried and packed correctly to ensure safe storage and delivery. The teams we send to your home are professionals with extensive moving experience. And while we’re experts at moving, we draw the line at installation and/or reassembly. No mounting TVs, no re-building a bunk bed or hooking up a washer. It’s better (and cheaper) for you to find a local handyman to take care of those tasks, and get them right the first time. Our business is built on trust. We pick-up, store, and return the things you love. Family photo albums, holiday decorations, and your favorite clothes are irreplaceable and it’s our responsibility to treat these treasures carefully. To that end we have several safeguards in place: "We guarantee what we can see" When Boombox picks up the items you are storing we take our own pictures so that we have a record of what was stored and to verify that every item you store with us is returned safely. Note: we can not insure the contents of a box. You are responsible for securely packing your items. This helps protect us from insurance fraud. Rigorous Recruiting Process Boombox performs background checks, and uses a thorough interview process to make sure that our team is made up of people who are honest, hardworking, and focused on great customer service. Limited Security Warranty Policy Boombox will reimburse you for loss or damage to your Goods that were properly packed in Storage Boxes that have been damaged or lost while in our possession. Please review our Limited Security Warranty Policy for complete details. Are my items stored in a secure warehouse? Yes. Boombox stores your items in commercial warehouses with 24/7 security. Only authorized personnel are allowed near stored items, our warehouses are closed to the public. Can I visit the Boombox facility to access my items? Boombox makes storage simple by bringing your items right to your doorstep. For security and insurance reasons, we cannot permit access to our secure storage facility. All credit cards are processed with Square which guarantees the safety of your credit card information. Within 48 hours of your initial pick-up, you will be able to log in to your Boombox account and view your online storage unit. Once you’re logged in, you’ll be able to see all of your items in storage. Anytime you need something returned, simply log in to your account, click on the item you want returned, and schedule a return delivery date and time. I moved outside the service area, how do I get my stored items back? Boombox does not provide shipping services but we can help facilitate a big move with the shipping company you choose. Text us at (415) 322-3135 to find out how we can help. Can I incrementally add to my amount of stored items? You can add to your stored items in increments of Quarter Van, Half Van or Full Van amounts. Also if your items fit inside your exisiting storage space you'll only be charged a $25 pickup fee.